Creating a photo shoot checklist can improve your photography! Save yourself some grief with a simple checklist! Why do I need a photo shoot checklist? Imagine for a moment, after completing the exhausting and very time-consuming accent to the summit of Mount Fuji, you turn to your backpack to retrieve your favorite and most dependable lens, but to your dismay, it’s nowhere to be found. Immediately, as your heart sinks into an abyss of despair, you realize that you left home without it! Indeed, a list and a bit of planning can go long way in preventing such tragedies. Using a checklist can help you stay focused on getting the shot! Often, the simplest solution makes the most sense. Truly, using a checklist for your next planned photo shoot can make life a little easier. From pen and paper to cellular phone applications, a variety of available options can prevent the terrible feeling of disgust that tends to accompany failing to prepare adequately. More importantly, a little organization will help free your mind and allow you to stay focused on the more critical aspects of a photo shoot. What is the best photo shoot checklist to use? Today, most people carry a cell phone. I’m sure one can find a variety of smartphone apps with all the necessary bells and whistles. In fact, I already use several photography-related apps such as a depth of field calculator. Although I’m quite certain most anything will get the job done, I prefer to use good old fashion technology. Nevertheless, one may opt for the more advanced pen and paper method which doesn’t require the use of batteries. Indeed, today’s powerful smartphones are very useful. Moreover, using Apple’s notepad allows me to synchronize checklists between my iPhone and Mac. 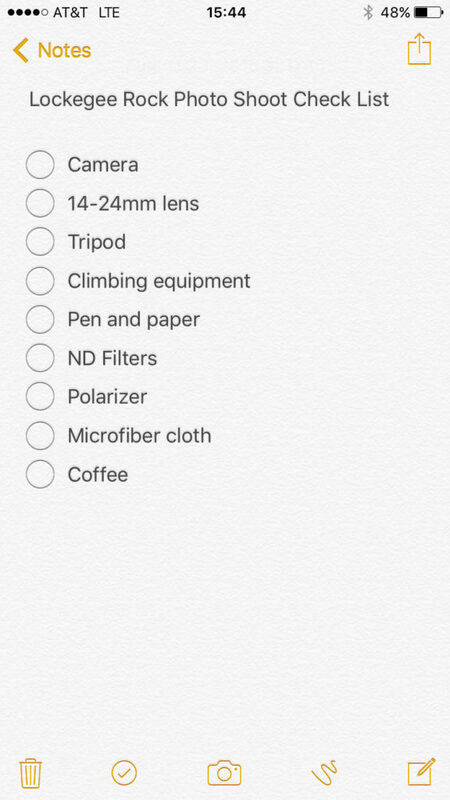 Consequently, I create a checklist using notepad on my mac and it magically appears on my phone. Take a look at the notepad on my iPhone.